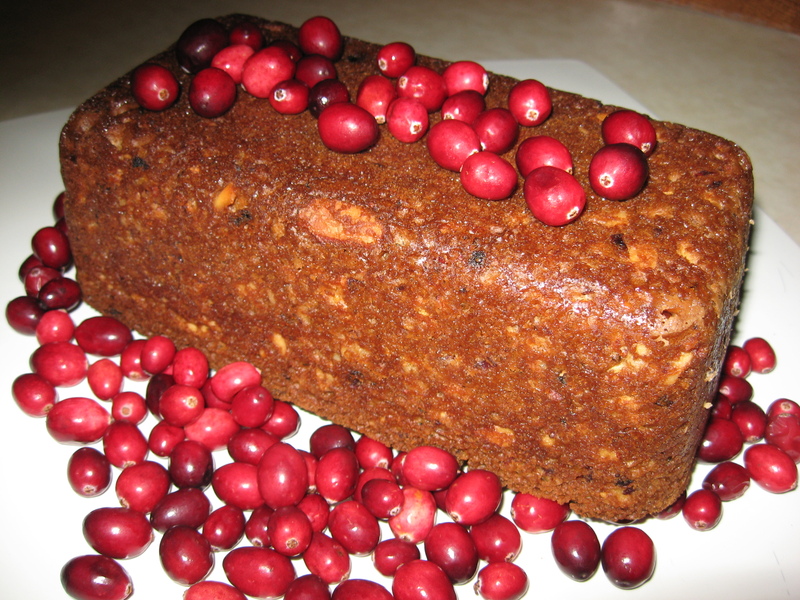 This is such a delicious quick bread and it is a breeze to make. A sliced piece comes out looking so colorfully festive and when you top it with some cream cheese it’s the best. Actually this recipe makes me think of my Mother who was from Holland. She would slice a thin piece of this kind of loaf and place it in the middle of two pieces of toasted regular bread that had lot’s of butter on it and enjoy it that way. Oh well, no different than using left-over turkey, cranberry sauce and left-over turkey dressing as a sandwich filling—which I do love and I bet a lot of you do to. 1 C. chopped nuts—any kind that you like. I used almonds. In a large bowl combine the liquid ingredients (I used a whip); blend well. Add dry ingredients (I sifted mine) until moistened. Bake at 350 for 50 to 60 minutes. (Here in Ketchum, 50 minutes did the trick.) An inserted toothpick in the middle of the loaf should come out clean. Cool 10 minutes at least before removing from pan. Cool totally and try not to eat it all at one sitting. Wrap tightly and store in frig. Hints: No need to use a mixer or beater. Also, you can make 3 small loafs and bake for 30 to 35 minutes. I haven’t tried freezing, but I’m sure that would work. Make sure to wrap in plastic wrap to keep the loaf moist when storing in frig. or freezing. I do love, during winter, shanks. It’s sort of like soul food-the kind that makes you feel good inside. There are so many different ways of cooking them—stove top, in the oven, and even in the micro. In fact I once made the micro version that turned out to be the best. I need to look for that recipe. However, this is a basic recipe which I think always turns out tasty. This time I used beef shanks because they were so reasonably priced. In a plastic baggie, place enough flour, S&P and dried or chopped fresh oregano ; shake well to mix; then place the shanks in the baggie; shake once more to lightly flour them. Make sure your shanks don’t have too much flour on them. In a large and semi-deep skillet place about 2 Tblsp. olive oil and brown the shanks on medium high heat on all sides (about 4 minutes per side). Transfer to a plate. You’ll probably want to add some more olive oil at this point to the hot skillet; add your veggies and the thyme. Over medium heat stir and brown your veggies for about 10 -15 minutes or till tender and translucent. Make sure they don’t get too done. Put shanks back in skillet on top of veggies, add the wine and bouillon and simmer covered on very low heat (but where you see some heat bubbles rising to the surface) for 3 to 3 ½ hours or till shanks are tender and are almost falling off the bone. Make sure to keep an eye on this dish and don’t let the liquid evaporate too much. If need be add more wine or bouillon. I usually add some more liquid about 1/2 way through. I serve this dish with my no-trick popovers and a nice salad or veggies. You can also serve it with cauliflower puree or mashed potatoes. If you wish another variation for this recipe, you could add some chopped tomatoes—either canned or fresh if tasty. Or you can use white wine and rosemary as a seasoning. Also, you can top this dish off with chopped parsley and even some lightly sautéed in butter mushrooms. Fun to experiment isn’t it? 1 nice creamy white cauliflower: about 8 C. of bite-size pieces (but if you wish to be inventive another color will do) and save the stem greens if you wish to use in presentation decoration. Place bite sized cauliflower florets in a microwave safe dish along with the minced garlic and diced apple- and just a bit of water with a cover and microwave on high for about 8 minutes. Steam until very tender. Then drain well. At this point, either use a potato smasher to smash everything before putting in a blender to puree; or use your food processor to puree the ingredients. Before switching your machine switch on, add the milk, 1 heaping Tblsp. Parmesan, 1 Tsp. butter and S&P. 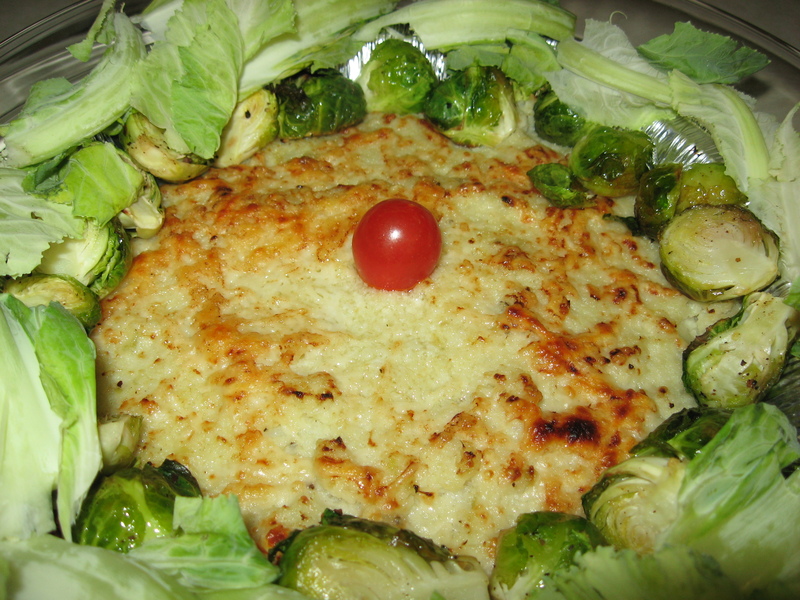 By the picture, you can see that I surrounded this dish with roasted Brussels sprouts and the very exterior rim is lined with the leaves I had saved from the Cauliflower itself. Variations include using different kind of cheeses, chopped herbs without the apples; or even nutmeg, cinnamon or currents with the apples; and so once again, it’s your imagination that can rule. I imagine you could even use rich cream or 1/2 & 1/2 instead of the milk. In conclusion, this can be a very healthy dish and it’s fun to play around with and with which to surprise you dining guest. 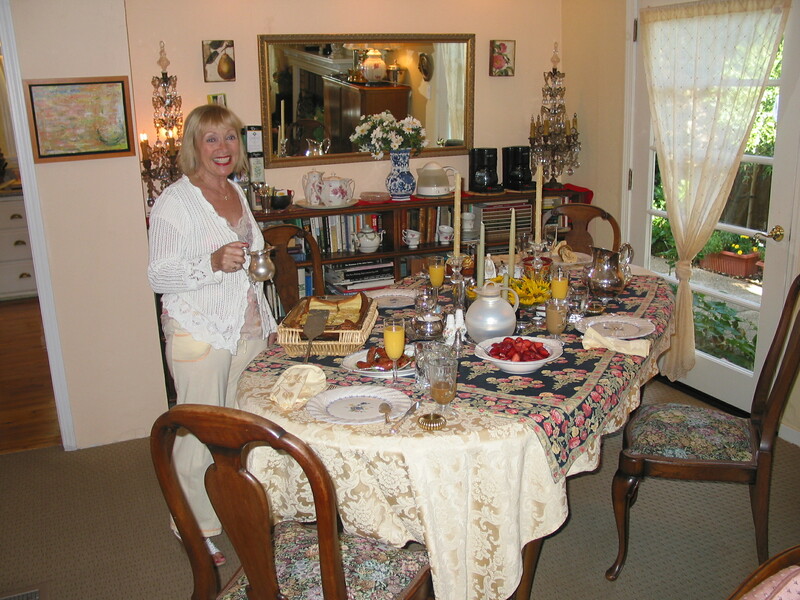 Bon Appetit from Margot, TempInnKeeper. Baste: to moisten foods during cooking with pan drippings or special sauce in order to add flavor and prevent drying. Bisque: A thick cream soup. Blanch: To immerse in rapidly boiling water and allow to cook slightly. Also can be called parboiling. Bombe: A still-frozen rich cream or custard pudding. Braise: Braising begins like sauteing-you brown the food in a bit of fat, but it continues by adding liquid to the pan, covering it and finishing the cooking over moist, low heat(you don’t boil the food, you simmer it). It’s ideal to cook big chunks or large cuts of meat. Caramelize: To heat sugar in a skillet until melted and brown or to heat foods containing sugar until light brown and caramel flavored. 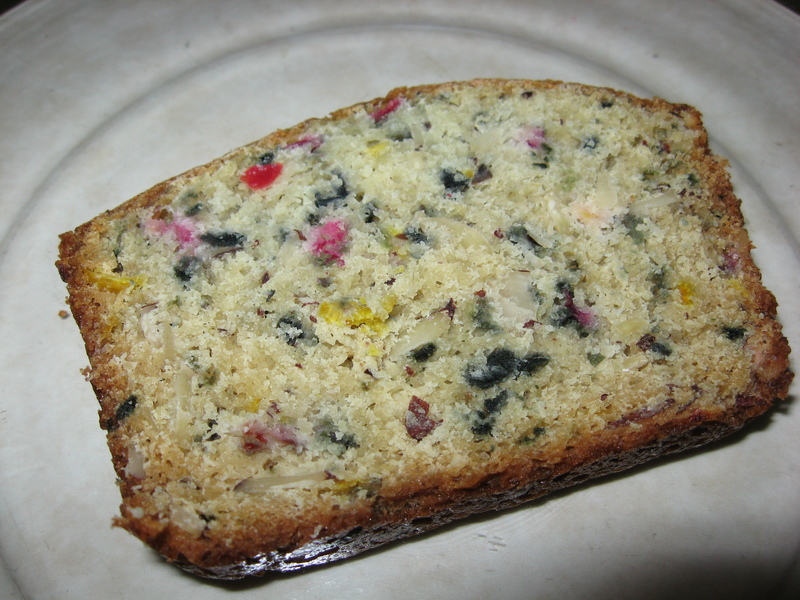 Charlotte: Usually a gelatin dessert with flavored shipped cream molded in a form lined with cake or lady fingers. Clabber: Milk soured to a point where there is a market precipitation of curd but no separation from whey. 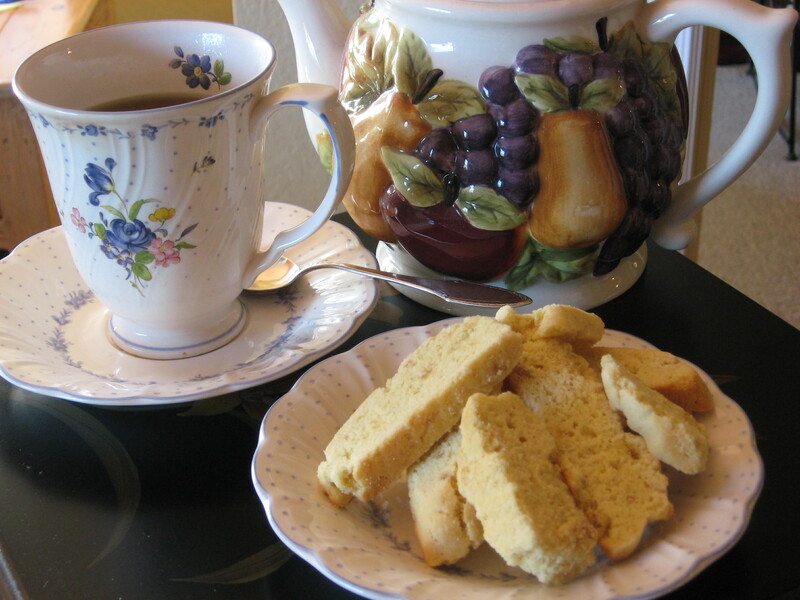 Buttermilk, sour milk, clabber and yogurt may be used interchangeably in cooking. Condiments: Food seasonings such as salt, pepper, vinegar, herbs and spices. Relishes are frequently called condiments. Compote: Sweetened stewed fruit left whole or in pieces. Court Bouillion: A highly seasoned fish broth. Cream: To soften a fat, especially butter, by beating it at room temp. Butter and sugar are often creamed together, making a smooth, soft paste. Crimp: To seal the edges of a two-crust pie either by pinching them at intervals with the fingers or by pressing them together with the tines of a fork. Crudités: An assortment of raw veggies that is served as an hors d’oeuvre, often accompanied by a dip. Cuisine: Literally “kitchen” in French. Cookery or a style of cooking. Degrease: To remove fat from the surface of stews, soups or stock. Usually cooled in the frig so that fat hardens and is easily removed. Deglazing: Using a liquid to release the flavorful bits that remain after cooking as in”deglazing the pan afterward” to make a sauce known as a reduction. You can deglaze with lemon juice, vinegar, wine,stock, juice, cream or a combination. Dissolve: To liquefy a solid food, to melt. Drippings: The residue left in the pan in which meat or poultry has been cooked. Dust: To sprinkle lightly with flour or sugar. Dredge: to coat lightly with flour, cornmeal, etc. Flake: To break up into small pieces with a utensil. 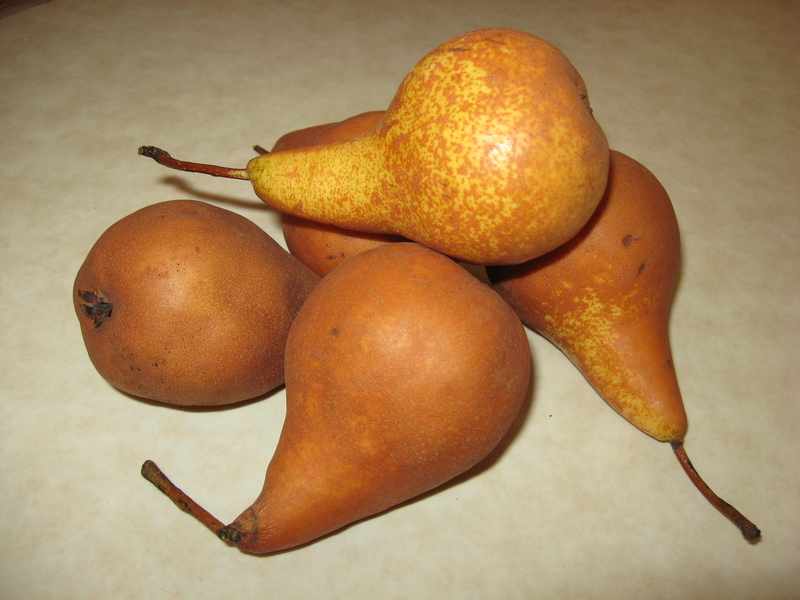 Flambé: To cover or combine food with spirits and serve is lighted as Pears Flambé. Frappe: Sweetened fruit juice frozen until of a mushy consistency. Fold: To incorporate a delicate substance, such as whipped cream or beaten egg whites, into another substance without releasing air bubbles. A spatula is used to gently bring part of the mixture from the bottom of the bowl to the top. The process is repeated, while slowly rotating the bowl, until the ingredients are thoroughly blended. Glaze: To cover with a glossy coating, such as a melted and somewhat diluted jelly for fruit deserts. Goulash: A Hungarian thick meat stew. Gumbo: A term used for okra or mixtures with okra. Heat:This is a very integral and important part of cooking. Preheating your skillet for grilling or sauteing is a must for browning and proper cooking. Like wise with the oven; 350 degrees is not hot enough to brown most meats; you need a higher heat like 450 or more if you want to put a nice crust on the food you are cooking–bread or chicken. You’ve probably heard the poo-pah about electric stoves versus a fancy gas one, but that really is baloney. Heat is heat and you just have to know how to use it. With electric, if you know that you are going to need an element for high heat cooking, start it before you do your cooking. If then you have to transfer from the high electric element to a low heat element, prepare for that by turning another element on your stove to low so that you can transfer your pot easily without having to remove it off the burner. Of course, if all of your burners are full, you will have to remove it for a moment. I’ve even done fabulous cooking in the micro and a small portable oven which also had the ability to go convection–like lamb shanks, muffins, etc.. I’ve done cooking in all sorts of kitchens–some of them with no more than a portable 2 electric burner unit, a micro, and well, you’ve gotten the idea. If you want to make a gourmet meal, you can make it almost under any condition and any where. 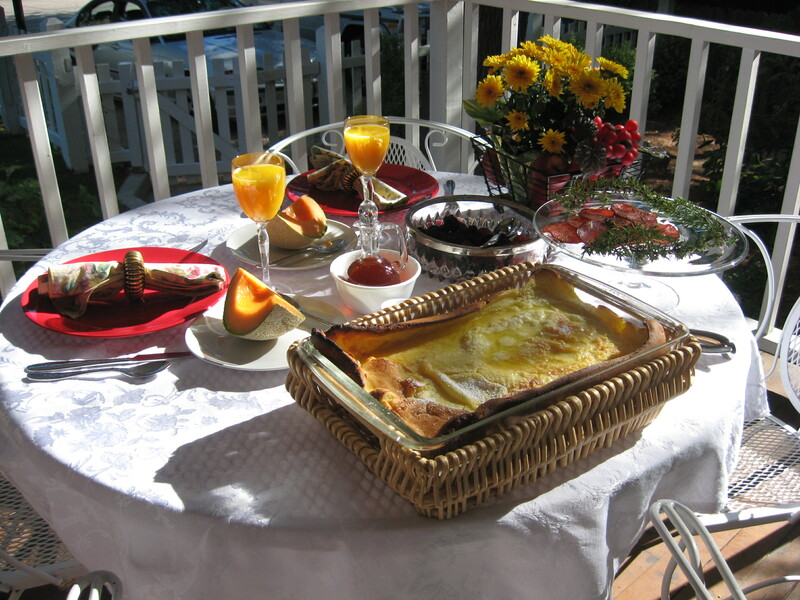 Hollandaise: A sauce made of eggs and butter, served hot or cold with vegetable, fish, or eggs. Julienne: to cut or slice veggies, fruits or cheeses into match shaped slivers. Lyonnaise: usually cold boiled potatoes shopped and sautéed with butter and onions. Marinade: An oil and acid mixture in which food is allowed to stand to gain flavor or tenderness. Marzipan: A confection of almonds reduced to paste with sugar. Marinate: To allow food to stand in a liquid in order to tenderize or to add flavor. Meuniere: Dredged with flour and sautéed in butter. Mince: To chop food into very small pieces. Mousse: A mixture of sweetened whipped cream and other ingredients frozen without stirring, or combinations of cream, fruit, meat, vegetable, etc. thickened with gelatin. Parboil: To boil until partially cooked: to blanch. Usually final cooking in a seasoned sauce follows this procedure. Parfait: A frozen dessert consisting of beaten egg whites or yolks cooked with hot syrup and combined with whipped cream or a mixture of ice cream, fruit, and whipped cream. Poach: To cook gently in hot liquid kept just below the boiling point. Polenta: Italian dish of corn meal. Puree: To mash foods by hand by rubbing through a sieve or food mill, or by whirling in a blender or food processor until perfectly smooth. Ragout: A de luxe concoction, but literally a thick, well-seasoned stew. Refresh: to run cold water over food that has been parboiled in order to stop the cooking process quickly. Render: To free fat from connective tissue by heating slowly until fat melts and can be drained off. Rissole: To sear or brown food with a protective covering, or a baked or fried pastry filled with meat, fish or fruit. Roux: A melted fat and starch base used mainly for thickening sauces or soups. Reduce: To lessen a quantity of fluid by boiling it away-usually with out a cover/top. Sauté: To cook and/or brown food in a small quantity of hot shortening. Saute in French means “to jump”. Scald: To heat to just below the boiling point, when tiny bubbles appear at the edge of the saucepan. To immerse food in boiling liquid for a short time. Scallop: To bake food in layers covered with sauce and crumbs in an oven-proof dish. Score: To make light cuts in a surface, usually in lines. Sear: To brown the surface of meat by quick application of intense heat, usually in a hot pan or in a hot oven. Shred: To cut into very thin slices or strips. Shortening: Any kind of fat suitable for baking. Simmer: To cook in liquid just below the boiling point. The surface of the liquid should be barely moving, broken from time to time by slowly rising bubbles. Sliver: To cut or shred into lengths. Steaming: Steaming is cooking over, not in, liquid. Steep: To let food stand in hot liquid in order to extract or to enhance flavor, like tea in hot water or poached fruit in syrup. 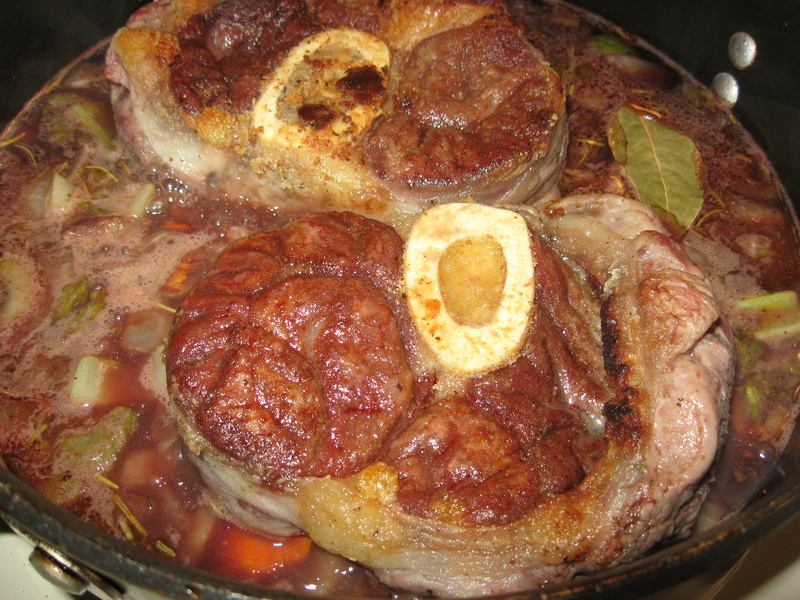 Stewing: Braising, but usually with no initial browning and with more liquid. Stir Fry: Stir-frying is similar to sauteing in that food is cooked over high heat in a small amount of fat. Food to be stir-fried is cut up before cooking; liquid is added during the cooking; and stir-frieds are most often associated with Asian foods which sautes are European. It’s all a matter of tradition. Stock: The liquid resulting from the cooking of meat, fish or vegetables-an invaluable aid in making gravies, sauces, soup, and adding interest to vegetables. Toss: To combine ingredients with a repeated lifting motion. Until Set: Until a liquid has become firm, usually applied to a gelatine mixture. Veloute: A basic white sauce. Whip: To beat rapidly in order to incorporate air and produce expansion, as in heavy cream or egg white. Paprika= cayenne pepper (just a dash because it’s hotter than paprika. Curry Powder, All Purpose=1 tsp. black peppercorns, 3 Tblsp. cumin seeds, 4 Tblsp. coriander seeds, 1 Tblsp. ground ginger, 2 Tblsp. ground turmeric. Toast and grind the first three spices. Mix them with the ginger and turmeric. Store in a sealed jar for several month. To make this a hot cutty powder, add ½ Tsp. or more ground cayenne. Makes ½ C.
Curry Powder,Fragrant: ¼ tsp. nutmeg pieces, ½ tsp. black peppercorns, 3 cloves, 1 tsp. cardamom seeds, 1 (2-inch) piece cinnamon stick, 1 tsp. fennel seeds, 1 tsp. fenugreek seeds, 2 Tblsp. cumin seeds, 4 Tblsp. coriander seeds, 1 Tablsp. Ground ginger, 2 Tblsp. ground turmeric. Toast and grind the first 9 spices. Mix them with the ginger and turmeric. Store in a sealed jar for several months. Makes ½ C.
Garam Masala: ½ tsp. nutmeg pieces, 1 (3-inch)piece cinnamon stick, 3 cloves, 1 Tblsp. coriander seeds, 2 tsp. cardamom seeds. Toast and grind all spices together. Store in a sealed jar for several months. Makes ½ C. (This is a mild almost sweet curry) Add ¼ Tsp. of saffron if you have it. Creme Fraiche: 1 C. light cream & 2 Tblsp. buttermilk in a glass container. Let stand at room temp for 8-24 hours or until thick. Stir well, cover and refrigerate for up to 10 days. I’ve actually found that it can get thick in 10-15 minutes. Brown Sugar 1/2 C. 2 T. molasses in 1/2 C. granulated white sugar or 1 C. molasses plus ¼ to ½ Tsp. soda and reduce the liquid ¼ C or 1 C. maple syrup and ¼ C. corn syrup and reduce the liquid ¼ C.
Granulated White Sugar 1C. 1 C.honey plus ¼ to ½ Tsp. soda and reduce the liquid by ¼ C.